Giorgio Moroder is remarkably multi-faceted. An Academy Award-winning composer, a world-recognized songwriter, a prolific producer, a stunning artist, a skillful designer, an innovative filmmaker, and entrepreneur, he is best known for his much-awarded and chart-topping music. Moroder has worked with many of the most famous names in music including Barbra Streisand, Elton John, Cher, Roger Daltrey, Janet Jackson, Freddy Mercury, David Bowie and Pat Benatar. And among his hit singles are Donna Summer's "Hot Stuff" and "I Feel Love," Kenny Loggins' "Danger Zone," Irene Cara's "Flashdance (What a Feeling! )," David Bowie's "Putting Out the Fire" and Blondie's "Call Me." His many film scores include three Academy Award winners. The first came for his score to the powerful film Midnight Express. Next recognized was Irene Cara's inspirational hit, "Flashdance," from the film of the same title. And then the highly romantic song, "Take My Breath Away" from the film, Top Gun, brought his third Academy Award. Not surprisingly, compositions by Giorgio have also contributed to numerous other hit films such as The Never Ending Story, American Gigolo, Cat People, Superman III, Scarface, Rambo III, and Beverly Hills Cop II. And his music has attracted many other awards including four Golden Globes, two People's Choice Awards, and more than 100 Golden and Platinum discs. In February 1998, he received his third Grammy for the song "Carry On, performed by Donna Summer and Giorgio Moroder. Moroder's musical creativity has also touched the realms of sports and world peace. He wrote the songs "Reach Out" for the 1984 Los Angeles Olympics, "Hand in Hand" for the 1988 Seoul, Korea Olympics, and the world wide hit song "UN ESTATE ITALIANA" for the 1990 Soccer World Cup in Italy. Always evolving as an artist, Moroder continues to find new outlets for his musical talents. The latest is the stage. He is currently involved in musical stage productions. One is inspired by Flashdance-the popular motion picture featuring Moroder's Oscar Award-winning hit song, "Flashdance (What a Feeling!).". One of Giorgio's initial projects in computer art was the groundbreaking award winning film short, A Special Tree. This innovative film is composed of hundreds of photographs which he digitally reworked on his computer into a psychological mystery. And he has also been involved in other film and video projects. Giorgio produced a documentary for German television titled, The World in Which We Live, and he restored Fritz Lang's classic silent film, Metropolis, enhancing it with beautiful music in the process. Originally from Val Gardena-Dolomiti, Italy, Moroder spent his early years in music touring Europe playing the bass and guitar in mostly pop-oriented ensembles. He eventually teamed up with Pete Bellotte and produced the seventeen-minute "Love to Love You Baby" performed by Donna Summer. That song is credited with starting the popular disco craze around the world. In 2004 Moroder was honored at the Dance Music Hall of Fame ceremony, held in New York, when he was inducted for his many outstanding achievements and contributions as producer. 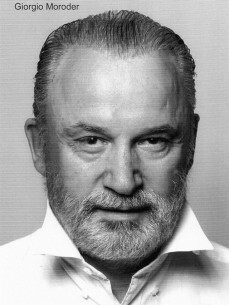 In 2005, he was given the title of Commendatore by the then President of the Italian Republic, Carlo Azeglio Ciampi. In 2012 he started his new passion: DJ at the Louis Vuitton show in Paris, the Amfar-Elton John Benefit Party at the Cannes Film Festival, the Munich Film Festival, the Red Bull Music Academy in New York. In 2013 he collaborated on the song “Giorgio by Moroder” with the electronic group Daft Punk. Giorgio will be performing around the world in 2013 at festivals including Way Out West in Sweden, WIRE in Japan, Electric Picnic in Ireland, Electronic Beats in Vienna, and HARD in Los Angeles, CA.